Today I took a quick ride up Kennedy for the first time in quite a while. I got out at about 9:30, and headed up the hill. This was the first time I had ridden up Kennedy on the new/old bike, and I was wondering how it would feel on the very steep climb. As it turns out, I felt fine climbing on the bike, but on the very steep pitches I couldn't find any balance. My front tire kept lifting, possibly because it wasn't weighed down by heavy shocks. As a result, I made pretty good time overall, but failed to clear the last two steep bits just before the junction with Priest Rock. I don't think I've ever cleared them, but in the past I feel like I've been closer. After the junction with Priest Rock I had intended to continue toward El Sombroso, but something funny happened. I realized that I was utterly uncomfortable going downhill, possibly due a lack of recent experience on a mountain bike, or possibly due to the bike geometry, but quite likely due to the fact that the last time I came this way, I went down three times. For some reason I thought Priest Rock might be a little cleaner, although that had me spooked, too. Ultimately the problem is that I don't have the confidence to descend through loose gravel or dust at speed, so I use the brakes. But that's just self-defeating; using the brakes makes one unstable. I either have to ride my mountain bike much more often, or much less. I eventually made it down to Alma Bridge Road, and took the Jones Trail into Los Gatos, then Kennedy on home. A short ride today, just over 20 miles but with 3100 feet of climbing. The most difficult kilometer was near the bottom of the Kennedy Trail, just before the flat section that contains the tree. That surprised me; I thought the section after the tree was more difficult, but perhaps that's just because I'm always spent by then. Today I took advantage of the lovely weather and rode to Big Basin Redwoods, and more specifically rode up North Escape Road for the first time. I got out just before 9, and rode up to summit the familiar way: Kennedy, Los Gatos Trail, Old Santa Cruz Highway. I wanted to scout out a place to take pictures on the upcoming Tour of California stage that runs through here, so I rode northwest on Summit, then down Bear Creek Road to Boulder Creek. The answer, by the way: there's a section of Bear Creek Road at about 1500 feet that's steep and in sunlight, so it'll do. 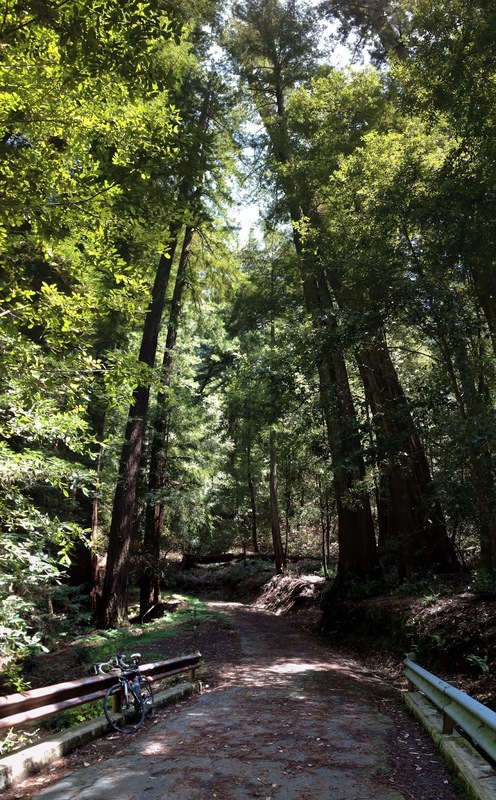 I had lunch in Boulder Creek, then headed up Highway 236 into Big Basin. At the park headquarters I rode through the parking lot, which puts you on North Escape Road. The road runs north a bit, then is gated to car traffic. After that point it shrinks considerably and, though it remains paved, it's blanketed with a layer of pine needles. It's also far enough from the parking lots that you basically have the road to yourself, which is an amazing luxury. The road is pretty flat until it reaches a bridge across Opal Creek, when it becomes quite steep. The most difficult kilometer of the ride was in this section, with a grade of about 9.6%. The road winds its way back to Highway 236 at about 1400 feet. I enjoyed the climb up to Saratoga Gap, then managed to descend Highway 9 while not getting passed by a single car, at least until I was pretty close to town. After that it was back the way I came. This trip was about 74 miles, with over 6800 feet of climbing. A great day out. I wanted to take another quick trip up Umunhum this morning, but they were still trimming trees and I didn't want to wait. So I turned around, cut it short, and instead headed up the roads accessible from the north end of Hicks, for the first time in quite a while. It's been quite a while since I last visited Reynolds Road. I had apparently forgotten just how steep it was. I rode up to the fork in the road, but turned around at that point because I wasn't relishing the idea of descending on the dirt. I only noticed one difference from a year and a half ago, which was that the gate near Hicks Road is now just a normal MROSD gate, not the private gate that used to be there. I'm under the impression that the district also bought the property at the top end of the right fork in the road, so maybe that's looking more like MROSD land, too. On the way back I also went up Pheasant Road, just up to the gate. No changes there. I also went up Montego Ct on the way back, just trying to get a little exercise. A very short ride -- 16 miles, with 1700 feet of climbing. The most difficult kilometer was in the middle of Reynolds Road, with a grade of 10.7%. Reynolds Road, from Hicks up to the fork, is 1.6 miles at 9.3%. A quick trip up Umunhum this morning. 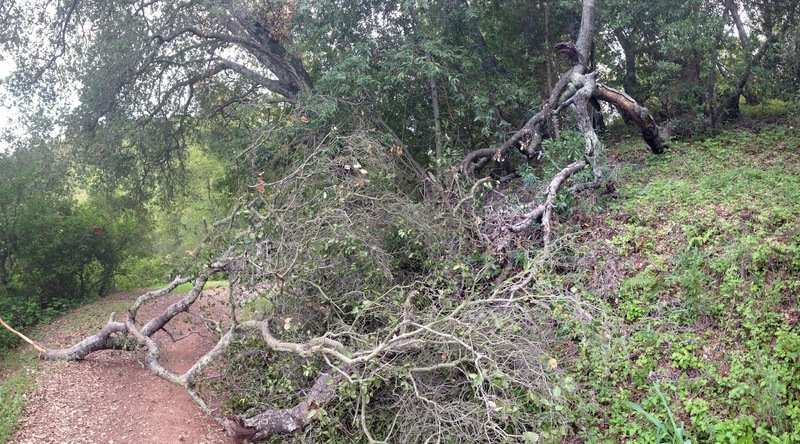 I got out shortly after 9 AM, but got stuck at the base of the Hicks climb waiting for tree trimmers to clear a lane. I guess that's what happens when one rides during the week, when normal people work. It was clear and warm on the north side of the mountains, but when I got to the top of Hicks, I could see clouds rolling over the peaks. The temperature dropped a good 10 degrees as I got to the gate at an altitude of 2200 feet, then continued dropping as I approached the "legal top" at 2800 feet. The mist blew fiercely across the road, but wasn't as cold as I thought it would be. Where the mist hit the occasional tree, it would rain on the leeward side -- the mist collected on the trees, then got blown off in larger drops. I descended slowly, dodging potholes, then went south on Hicks to complete the counter-clockwise route around Quicksilver Park. A short ride of 23 miles, with 2600 feet of climbing. I was surprised to find that the most difficult kilometer was not on Hicks, as I had always thought, but was in fact very near the top of the climb. That section came in at 10.2%, whereas the climb as a whole was 4.3 miles with a grade of 9.3%. It's suddenly hot in the valley. It was supposed to be hot on Friday, then even hotter over the weekend. So I decided to get out on Friday to beat (a little of) the heat. I got out at about 10:30, and rode up through Los Gatos and Old Santa Cruz Highway to Summit Road with no real plan in mind. Since it was about lunchtime, I went to the Summit Store for a half-sandwich and decided to ride up to Loma Prieta, and then down to Mount Madonna. After lunch on the busy patio, I headed up Loma Prieta Avenue. It was properly hot. My Garmin device was routinely showing 95 degrees, but that's affected by the sun (I, too, am affected by the sun). Regardless, I drank a lot of water, and was wondering whether I'd have enough, considering that the next fountain was in Mount Madonna park. I plodded up the hill in reasonably good form, and gingerly descended the second dirt section of the day to Mt Bache Road. Then it was up the sharp hill on Mt Bache Road, then a flat bit, and finally the one mile climb up to the 3000 foot level. The most difficult kilometer of the day was in the middle of this climb, averaging just under 11% (the whole mile-long section is close to 10%). The last time I was up here, I rode up to the summit only to get kicked off by a ranger. This time I skipped it, and just continued down Summit toward Mount Madonna. The dirt section of Summit Road was terrible, as usual, but got worse. Apparently they've been doing some roadwork by dumping large, loose gravel. I suppose that's reasonable, but it's practically impassable on my skinny-tire bike. So I found myself walking through these sections, perhaps 10 sections of up to 100 meters each. These rocks are a much better deterrent to bicycles than those bogus signs ever were. I suspect they'll get embedded into the track by passing cars, and may be routine maintenance. But for now, I'm not tempted to return. By the end of the Summit Road, the third dirt section of this ride, one welcomes the return to smooth roads on which you can maintain some speed. On this day, the speed also meant a little cooling air, so that was especially welcome. I got to Mount Madonna Park pretty quickly, and filled my nearly-empty water bottles at a random water spigot. Then it was down the north side of Mount Madonna Road, the fourth and last dirt section of this ride. The rest of the ride, basically heading north on Watsonville and Uvas roads, was a battle against the wind. I can't understand why the hurricane I experienced in this section wasn't reported on the news. This ride was almost 67 miles, with 4800 feet of climbing. It seemed a lot harder than that, presumably because I was baking in the sun the whole time. 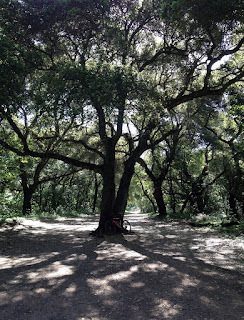 I got time for a quick ride yesterday, and decided to take my mountain bike to Quicksilver park. It was the first time I'd been there this year. I got going a little before 3 PM, and headed down the Hacienda entrance. It's been a long time since I've climbed this hill, and it wasn't noticeably easier. I went through English Town, then down the trail toward the reservoir. I recently switched my new but low-end mountain bike for bike that's 20 years old, but was a good quality bike at the time. The main differences are that it's rigid, and hence lighter, and has much narrower handlebars. This was the first real ride I've had on it in years. I found myself descending much slower than usual, due to some combination of the lack of suspension and my lack of recent experience on the mountain bike. The Randol Trail, which returns from the resevoir to the Mine Hill trail at the junction, is normally closed all winter since it's shaded and therefore doesn't dry well. Yesterday there were just a few muddy patches, all in one (not particularly shady) section. I'm trying to get acclimated to the upcoming heat, and while this ride was warmer, it was completely perfect 70 degrees as I was finishing up. This is a short ride of a little over 26 miles, 16 miles of which is to and from the park on the Alamitos Trail. I recorded something like 1800 feet of climb, which seems a little high. The most difficult kilometer was near the top of the main climb, as one passes through English Town, which averaged 9.3%. 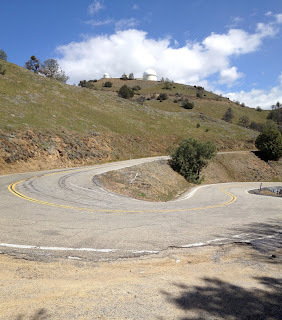 On Sunday I took advantage of the first really warm day of the spring to ride up to the Lick Observatory on Mount Hamilton. I got started late, partly because I had some work to do in the morning and partly because I wanted to skip the morning chill. When I started at shortly after 10, I left without my jacket for the first time in many months. As has been my habit lately, I took Quimby on the way up. On that steep climb I was reminded that my apparently improved form in the past few months has been partly attributable to the weather. I was wiping sweat from my eyes for the first time in a while, and feeling especially drained. Nonetheless, I got to the top and dropped into Halls Valley. In the park's parking lot I refilled my water (haven't had to do that lately, either) and ate a sandwich. Then I headed up the much less steep road to the peak. I hung around the peak for a while. A group of riders preparing to head down pulled out windbreakers, and I regretted my decision to leave the jacket at home. It wasn't cold, but I was sweating, and the wind can be bitter. I loitered in the wind long enough to get dry, which not coincidentally also chilled me to the bone. Nonetheless the trip down wasn't as cold as I had feared. For most of the way down I was involved in a traffic jam headed by an especially timid Nissan Versa. The Versa was going much slower than even I (a slow descender) wanted to go, and when the windbreaker crowd and another car joined the train, it was a little much for me. I suppose I could have passed the Versa, but it's dicey and the driver seemed easily spooked. So instead, I stopped for a bit and let them all go. Still, I caught them all, in the same configuration, before we all arrived at Smith Creek. If I had been feeling stronger I would have taken Quimby back home, but I wasn't quite there. Instead I took the easier but longer route down Mount Hamilton Road, then into San Jose and the Guadalupe River Trail. On the streets I had been running over lots of broken glass, and the trail was much worse. I got a flat somewhere near the 280 underpass, and I'm only surprised I didn't have several more along the way. This ride was 65 miles, with a little over 6000 feet of climbing. Hmm... is that possible? The Garmin said 6480, and my program that discounts minor climbs is what gave me 6000, but that's a lot of bits and pieces. The most difficult kilometer was, no surpise at all, near the top of Quimby Road. I measured the whole of Quimby Road at 3.14 miles, with an average grade of 10.1%. That most difficult kilometer averaged 13.1%. Last weekend I took I ride I've done several times before, down to Santa Cruz and then back on Mountain Charlie Road. I left the house a little before 9 AM, then went to Los Gatos over Kennedy. As I was riding down the Los Gatos Creek Trail, I hooked up with another rider going at roughly my pace, which is unusual for me. He was on his way to Carmel, so we chatted as we climbed up Old Santa Cruz Highway. At the Soquel/San Jose road, I peeled off and headed down into Capitola. The temperature rose to about 70 as I approached the coast at about noon. The beach was busy and there were at least a few surfers in the water. Once again I stopped at Betty Burger for lunch, then continued west toward the boardwalk. 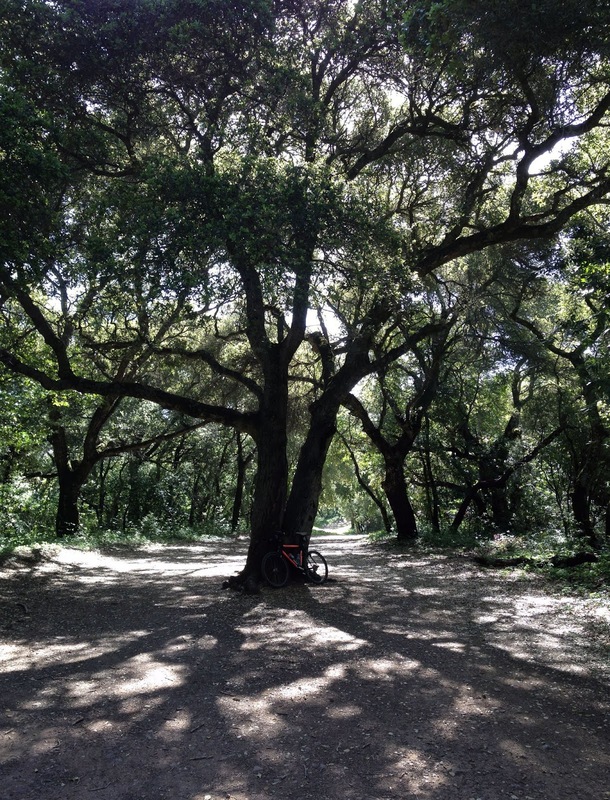 I rode up the west side of the San Lorenzo River, then crossed and started up Graham Hill Road. I cut over into Scotts Valley, then took Bean Creek Road to Glenwood, and then to Mountain Charlie Road. I now have my little analysis program calculating the most difficult kilometer of the ride. Difficult in this context means climbing, and the steeper the climb, the worse it is. On this ride, the most difficult kilometer was near the end of Bean Creek Road, when it rises steeply to meet Glenwood. That climb is a little over a kilometer long, and averages 7.7%; the most difficult kilometer averaged 8%. Before I started up the hill, I once again tried to find one of the train tunnel entrances around here. I rode up Glenwood up to Glenwood Cutoff, but didn't find anything. The woods have so much irregular detail that they could easy hide an overgrown entrance. After that it was back to Mountain Charlie, and up to Summit. At Summit I headed northwest to Bear Creek Road, and then down to Los Gatos, Kennedy and home. This ride was a little over 71 miles, with almost 5500 feet of climbing. On Sunday I had the ride I was planning to do last week. This time no rain, and mission accomplished. After watching the Tour of Flanders on fast-forward, I got started at about 9:30 on a cool but clear morning. I followed the same route as last week, through Los Gatos, Alma Bridge Road, the Old Santa Cruz Highway and Mountain Charlie Road to Summit. When I got to Bear Creek Road, I took a left instead of a right and headed down to Boulder Creek. On last week's rainy ride I ground away the last remains of my brake pads, so this was the first ride on the new KoolStop pads. They made a huge difference on the way down Bear Creek Road, giving me the confidence I needed to let 'er rip. Or as close as I get, anyway. In town I stopped for another great burger at Foster's Freeze, then headed up Big Basin Highway. When I got to the park headquarters I just continued on up the road, as I had done once before. And while there's nothing wrong with that ride, I realized when I got home and read Ray Hosler's blog that I should have taken North Escape Road instead, which I have not yet done. Next time through here, I suppose. As I headed up the hill toward the junction with Highway 9, I was really starting to feel drained. Maybe I wasn't eating right, or maybe it was last week's shortened ride, but in any case I wasn't looking forward to the climb up to Saratoga Gap. As it turned out, it wasn't as bad as I expected. I climbed up to the parking lot, and was slightly disappointed to find that the hot dog guy wasn't there. Maybe that's more of a summer thing? I took a good long break, drinking the last of my water and stretching. Then, after a very fast and enjoyable run down to Saratoga, it was back home via Los Gatos and Kennedy Road. This was an 8 ½ hour ride of a little over 70 miles, with 6700 feet of climbing. That's 8 miles and 700 feet of climbing more than last time, which I suppose comes from heading around Lexington Reservoir rather than directly up Bear Creek Road, plus the up-and-down on Summit. That's a lot for me, so I guess I shouldn't feel too bad about being so drained on the last climb.